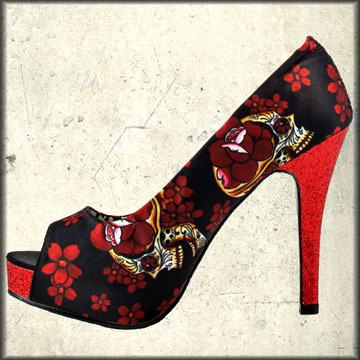 Iron Fist Slow Dance Women's slip on peep toe pumps features tattoo inspired artwork of colorful sugar skulls and flowers all over the front and back. Red glitter heel and sole creates a cool and edgy look. Polka dot print bow on the front. Color: black.